1. CHANGE FOCUS. When we read a story, we usually identify with one character in it. Figure out with whom you identify in this story — then choose someone or something else for your focus. The Israeli poet Yehuda Amichai did this to brilliant effect when he refocused on the ram in the Akedah, in The Real Hero of the Isaac Story. Ask yourself, whom am I overlooking? Then look at the story through his/her/its eyes. 2. READ A COMMENTARY. There are many different understandings of every story. Are you still stuck on the one you learned in school as a kid? Try searching the Virtual Jewish Library for insights on the story by searching the characters’ names, or check out a commentary in your synagogue library. 3. FOLLOW THE STORY ON A MAP. Use online resources (again, Virtual Jewish Library is great for this) to research place names in your story. Some locations in the Bible are unknown, but we have a pretty good idea where many things happened. Even the unknowns are interesting: what does it mean that we are not sure where the actual Mt. Sinai is? The day I figured out what it really meant that Naomi and Ruth walked from Moab to Bethlehem the story transformed for me. Two lonely women walked 46 miles through the Judean desert with no protection from wild animals or predatory humans – wow. It says something about both women that they survived the trip. 4. READ WITH A PARTNER. It is truly amazing how differently two people can read the same story, especially from Torah. Read it with someone else and listen to what they think of it. I always thought of Joseph as a hero, and was really shocked to discover that some readers think he was a horrible kid and deserved what his brothers did to him. 5. PLAY DEVIL’S ADVOCATE. This is a variation on the first tip. If there is a villain in the story (think Haman in the Esther story) try to read the story with sympathy for him. What was the Exodus story like from Pharaoh’s point of view? 6. ASK: HOW HAVE I CHANGED? One thing is for sure: while the letters on the Torah haven’t changed over the years, we human beings change over the course of our lives. The story about Jacob scheming to get his father’s blessing reads differently to a child than it does to a parent. All of these approaches have rejuvenated stories for me. 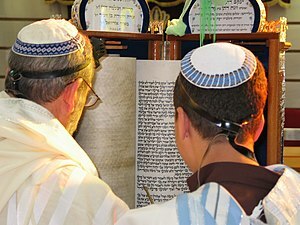 Reading Torah is a little like squeezing fruit: if you only squeeze it one way, you aren’t going to get all the juice. Try turning it a bit, as Ben Bag Bag suggests, to get a new flavor from an old story. “Reading Torah is a little like squeezing fruit”!